I love the look of these studs and the indentions on them. They make me think of little rivet heads or something. They're definitely different, compared to your standard, smooth-top stud. And I'm always for stretching the boundaries! I had no issues with these sticking up too bad, so they didn't catch on anything, they are a good size (3mm), and with topcoat over them, I never had one fall off. These studs came from Born Pretty Store. They come in a bag of 10 ct. for $3.28 (currently on sale for $2.30) USD. There are six styles, and they all come in silver or gold. I was able to peel the topcoat off of them when I removed them, so I can save and reuse them at a later time, with no polish residue or problems. 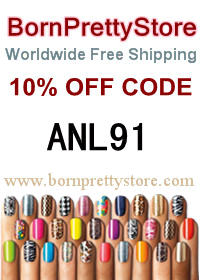 If you're shopping at www.bornprettystore.com, use my coupon code ANL91 and you'll get 10% off your purchase of regular-priced items!